Lisa here with a fun project using something you probably already have on hand... border punches. What a fun way to use this tool to create a bookmark or tag. The card is covered in some yummy papers included in the FRESH BAKED KIT. I layered the umbrella over the border punch tag and then cut around it. Gotta love those sweet pearls. I used the same border punch to create a matching bookmark. A simple little gift to include with a thank you card. I have a video to show you how easy it is to use your punches for bookmarks or tags. Don't forget there is a GIVEAWAY on THIS post. Thanks for stopping in, have a super day! Fabulous projects, Lisa! I love how the umbrella hangs off the edge of the card! 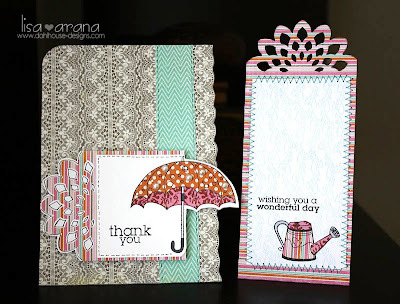 Great card "set" and video - thanks so much for sharing these! I learned some new tips by watching your video. Thanks so much, hope you don't mind I pinned ya'.